Superior Surface Refinishing uses a multi-step process to resurface your tubs, tile, acrylics, marble, fiberglass, arborite, vanities and cabinets. We can also do chip repairs and apply ASTM F 462 Approved Slip Resistant Surfaces as a safety feature for tubs and showers. Our EP-Acrylic by Integrity Coatings, is the best product that we know of available today for bathtub and tile refinishing. Integrity Coatings products have all proven their quality and durability over time, and are Isocyanate free for the protection of our technicians and our clients. If you like your tile but are having problems with mould build up in the grout lines, we have the solution. EP-Acrylic Clear Gloss can be sprayed to protect the grouting of tiles making mould build up a thing of the past permanently! This clear gloss will seal the grout lines so they clean as easily as the tiles do. You can choose solid colors, or we have our Stone Accents & Multicolor Finish options that also can be used. Regardless of your needs Superior Surface Refinishing, has the solution and at a fraction of the cost over replacement or custom fit liners. All bathtubs and tile surrounds are ready for use within 24 hours of the refinishing application minimizing the downtime and inconvenience. 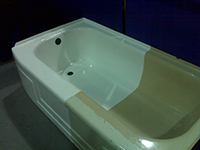 We also specialize in antique and Clawfoot tub resurfacing and refinishing. We can refinish the inside, ledges and, or the outside as well. Different colors can be chosen for the outside to match your décor for a truly stunning look. We also can supply you with many different accessories for your antique or claw foot tub including different style of feet with different finishes available. Contact us for more details on Clawfoot tub accessories. Refinishing is truly the most time efficient and cost effective solution to all your bathroom, tub, and shower remodelling needs! Check out our Why Refinish ? section for more information and the benefits of refinishing over other remodelling and renovation processes, then give us a call for a free estimate. This show tub was stripped of an old re-glazing finish and then half was refinished in our Brilliant White High Gloss, EP-Acrylic Finish. Call today and we can discuss the many different options available for your tub, surround, or shower. 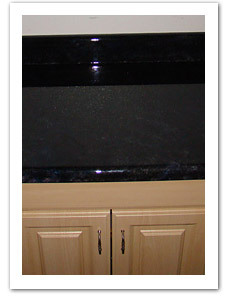 We also refinish large 1 piece & multi piece Acrylic Tub & Shower Enclosures as well. Call Today for details.